Survey USA has polled over 20,000 people in 14 states and 21 cities to ask who won the first debate. In 11 states and 15 cities Kerry was the clear winner. In 2 states and 6 cities, Bush was the clear winner. Colorado was a tossup. 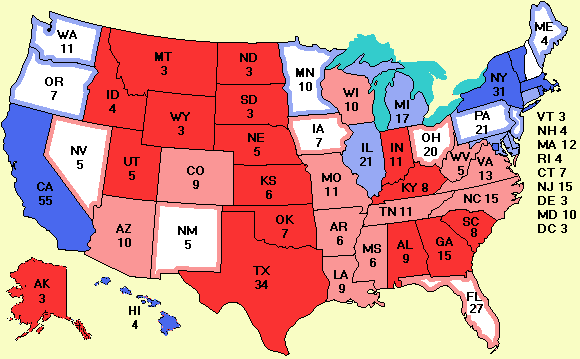 Ominously for Bush, the 2 states that said he won the debate are Texas and Oklahoma, which he has in the bag already, but the states that gave Kerry the win include Oregon (by 19%), Maine (by 18%), Pennsylvania (by 22%), Arkansas (by 12%), and most significantly Florida (by 24%). American Research Group has now produced more details on its post-debate poll. Not surprisingly, practically all Democrats thought Kerry won and practically all Republicans thought Bush won. But among independents, Kerry won by 19%. Gallup's lead story today is entitled "Kerry Wins Debate." According to Gallup's poll, 53% of the people interviewed felt Kerry won and 37% felt Bush won. How important are the debates, anyway? Take a look at John Zogby's view. The LA Weekly has a nice article about polls and how to interpret them. A number of people verified the push polling story in Maryland. The push poll is being run by the Maryland Republican Party. Shame on them. For new readers not familiar with the practice of push polling, the basic idea is that the pollster asks mostly normal polling-type questions, and then slips in a question like "Are you going to vote for John Kerry even though he has said he will raise your taxes?" or "Are you going to vote for George Bush even though he is going to reinstitute the draft and send your son to Iraq?" Push polls are based on misleading statements or sometimes complete lies. The purpose is to skew the "poll" to make one candidate look much better than he really is. If you are push-polled, immediately ask the pollster who is paying for the poll and refuse to go further until you get an answer. In some states it is a crime for a pollster to refuse to answer that question when asked point blank. A reader pointed out that George Bush's home town newspaper, the Crawford Lone Star Iconoclast, has endorsed John Kerry for President. Maybe they know something about George Bush the rest of us don't know. If the Boston Globe endorses Bush, I will certainly announce it here. While we are on the subject of jumping ship, Yesterday I had an item on President Eisenhower's son planning to vote for Kerry. In the interest of balance, today I have a link to a story saying former Democratic NYC mayor, Ed Koch is going to vote for Bush. Senate news: A new poll in South Carolina shows Inez Tenenbaum leading Jim DeMint for the open Senate seat there being vacated by Fritz Hollings. The pundits originally gave her no chance at all, but she is doing remarkably well at the moment. We'll see if it lasts, however.